Drs. Patrick and Edith McGeer are universally acknowledged as the leading researchers on Alzheimer’s and other neurodegenerative diseases. They are among the world’s top 100 most highly cited neuroscientists, beginning their work at the University of British Columbia in 1954 and continuing today. Both Doctors are Professors Emeritus in the Faculty of Medicine at UBC, and have given lectures around the world. Together, the McGeers have published more than 550 papers in international scientific journals. In addition to research, the pair continue to serve on many scientific review panels in the field of neuroscience. In addition to research, Dr. Patrick McGeer also served as MLA and Cabinet Minister until 1986, aiding in efforts to make British Columbia a major centre for research and development, and creating the Open Learning Institute of B.C. to provide skills training and university courses through distance education. In 2004, Dr. Patrick McGeer was awarded the Henry Wisniewski prize given to the top Alzheimer’s disease researcher. Their joint honours and awards include Honourary Doctors of Science degrees from UBC, the Medal of Service from the Cam Coady Foundation, the Clarke Institute of Psychiatry Prize from the University of Toronto, and a lifetime achievement award from the Science Council of B.C. The Drs. 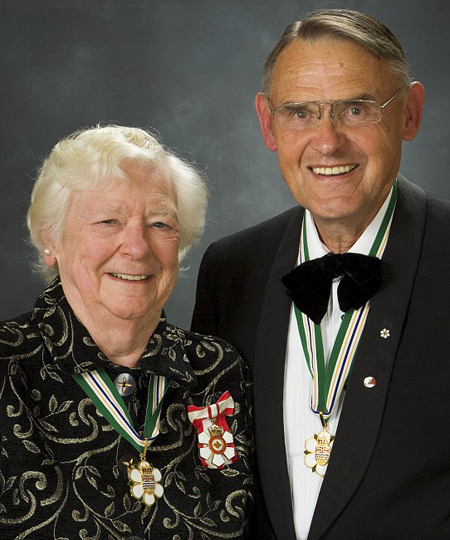 McGeer were jointly appointed as Officers of the Order of Canada in 1995, and Fellows of the Royal Society of Canada in 2002.